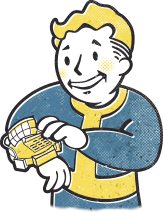 Fallout is a post-nuclear adventure board game for one to four players. Based on the hit video game series by Bethesda Softworks, each Fallout scenario is inspired by a familiar story from the franchise. Survivors begin the game on the edge of an unexplored landscape, uncertain of what awaits them in this unfamiliar world. With just one objective to guide them from the very beginning, each player must explore the hidden map, fight ferocious enemies, and build the skills of their survivor as they attempt to complete challenging quests and balance feuding factions within the game. As they advance their survivors' stories, players will come across new quests and individual targets, leading them to gain influence. Who comes out ahead will depend on how keenly and aggressively each player ventures through the game, however if a single faction is pushed to power too quickly, the wasteland will be taken for their own, and the survivors conquered along with it.